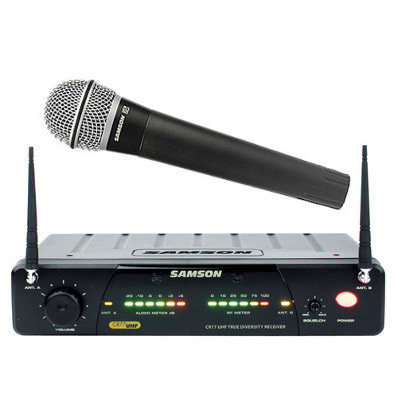 Our Wireless Handheld Microphone can be used up to 300' from the receiver and lasts about 12 hours on one 9-volt battery, included. Can be used with any sound system that has a standard 1/4" input (1/4" male cable included). Also available as a Lavalier (Lapel) Microphone. For those of you of the technical persuasion, here is a PDF of the manual.